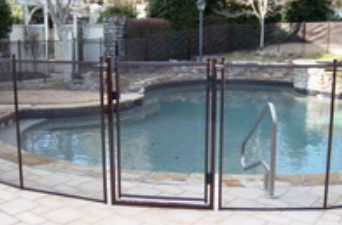 A Pool Safety Gate for your Pool Fence that you can trust in Tampa! Pool Guard has the top rated, self-closing, self-latching and key-lockable Swimming pool fence gate on the market today! It is available in multiple colors and comes in 4 foot or 5 foot heights. With over 18 years of experience in manufacturing and installing pool safety fences, Pool Guard has tried various types of gates for strength and durability. With tens of thousands of gate installations nationwide, Pool Guard has found that in order for a pool gate to stay safe and within adjustment, the pool gate should not be tension reliant on the pool fence. That is why Pool Guard actually puts their gates in a low profile framing system. This allows the gate to stand alone, or be monolithic. It's not tension reliant, thus it's designed to stay within adjustment which means better protection against accidental drowning. All Swimming Pool Fence Gates are not created equal! Call today to speak with a professional pool safety expert to discuss the many different pool fence gate options available and to understand why we feel our pool fence safety gate is the best and safest available in Tampa Bay. Why choose Pool Guard of Tampa Bay to install your Pool Safety Fence or Pool Net or Pool Cover? WE KNOW POOL SAFETY: Pool Guard of Tampa has over 17 years experience in removable mesh pool fence manufacturing, and installation. Pool Guards Fence and Net construction is the envy of the industry with strong, QUAD CORE aluminum fence poles, a self closing Thru-Close gate system backed by a Lifetime Warranty. Pool Guard™ swimming pool fencing and self locking gates are manufactured with the highest quality materials available, giving you the safest swimming pool fence or Net to prevent accidental drowning. WE KNOW SERVICE: We provide free estimates, quick turnaround and live phone support. We are long time Better Business Bureau members with an "A+" rating and multiple year winners of the Angie's List Super Service Company of the year award. This award is only given to the top 5% of service companies nationwide and represents excellence in customer service. We have won this award several years in a row: 2007-2015. Contact us today. 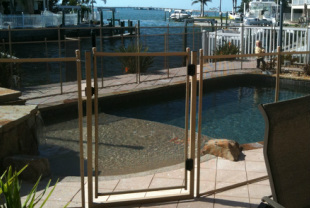 ​Tampa pool fencing, pool fence gates in Clearwater, swimming pool safety gates in St. Petersburg, FL are our specialty. Swimming pool fencing is often call baby guards, baby barriers, and child gates or guards. Many companies claim to protect a child using products such as pool safety nets Tampa bay and or alarms.